As soon as the Halloween costumes were put away, it seems like the Christmas trees instantly went up. It’s that time of year again! If you’re anything like me, you think it’s still a little too soon for the Christmas décor to come out. I mean, we can’t forget about Thanksgiving—which means more pumpkins and gourds. Fall isn’t over just yet. Although, I’m all for getting the Christmas shopping started early. Those last minute gift runs are stressful! Regardless, the upcoming holiday season means one thing for your home: lots of guests. Dinner guests, neighbors popping by, overnight out-of-towners… you name it. It’s called the most wonderful time of the year for a reason. Nevertheless, constantly having people in your home can cause even the most relaxed among us some stress. Never fear, though, you’ll be ready! Make your home smell amazing. This is easy to pull off, and the way your home smells has a significant impact on the impression it leaves. Realtors keep this in mind when trying to sell houses. Candles or wall plug-ins will do the trick, or try this: Put two full caps of vanilla extract in a mug, then place in the oven at 300 degrees for one hour. It’s a surefire way to make the house smell great. Organize the bathroom to make things easy to find. There’s nothing worse than having to ask where the toilet paper is stored. Set out some extra toilet paper, as well as soap, tissues and any other amenities your guests may need. At James Décor, we carry a line of soap that would be perfect for your guests. Check furniture for nicks and dings. If you find one, grab a touch-up kit to cover them up. You can find kits with markers in several shades to match a variety of finishes. Another trick is to fill in small cracks with crayon wax. Don’t overlook these minor imperfections—it’s all in the details. Try setting up a leftovers station. Gather some inexpensive plastic containers and bags, then fill them with leftover food for guests to take home. Label them with your guests’ names. It’s the easiest way to get rid of all that extra food, so nothing gets wasted. For overnight guests, keep extra toiletries in stock in case they forget something. Shampoo, face wash, lotion and toothbrushes are all good things to keep on hand. Prepare for a wide range of temperature preferences. Guests may wake up cold or hot and not want to wake you, so get ahead of the game. Set out extra blankets, a heater and a fan. Leave a notebook with important information you’ll need to communicate to your overnight guests on the nightstand. This could include the wifi password or any alarm codes they may need to know. This will save extra time exchanging information. Set out a key on a noticeable key-chain for your guests to borrow during their stay. This will make them feel welcome to come and go as they please. Declutter the area where your guests will be staying. Whether they get a whole room or a corner, make your guests feel like they belong by clearing out the area they will be staying in. This is a no-brainer, but something that can be easy to forget when your holiday to-do list is endless. Leave out some food and snacks for your guests in the morning, as breakfast is often overlooked with dinner stealing the show. Don’t forget to keep all the staples on hand—even the ones you may not usually use. Coffee, tea, cereal and fruit are all good choices. These 10 simple tips will get you started on preparing your home for the holidays. Most importantly, though, don’t forget to relax and enjoy this time of the year. There’s nothing better than a house full of ringing laughter, the smell of turkey and plenty of guests gathered around to make new memories. The house doesn’t have to be perfect for your guests to feel right at home. It’s easy to get caught up in the here and now, without regard for the past or future. Sometimes, though, it’s nice to slow down and reflect on times past. I’ve often found myself thinking about interior design and wondering, how did it all begin? James Décor, born in 1946, was Springfield, Missouri’s first design firm. The forties were a notable time in history—World War II reached an end, Roosevelt was in office and Casablanca was on the big screen. According to The People History, the average cost of a house was only $5,600. Times have certainly changed since then, but the interior design field continues to have a big presence in Springfield. This all leaves me wondering, when did the field of interior design itself originate, before it made it to Springfield? Rewind to 1904—just 42 years before James Décor was started. A now complex and ever-changing field, which typically requires an education and plenty of experience to enter into, all began with the interior decorators of the early 1900s. According to the Interior Designers for Legislation in New York, the term “interior decorator” was first coined in 1904. A lady by the name of Elsie de Wolfe earned the first interior decorator commission ever, the following year. Several years later, in 1923, the first professional design firm was started by the famous Dorothy Draper. It was the work of de Wolfe and Draper that helped establish the profession forever. According to Architectural Digest, Elsie de Wolfe, a prominent member of New York society, was an actress in the 1890s. Her theater work established her reputation as a set designer and costume designer. In fact, she was more popular for the costumes she wore than her acting. It was rare for a performer to choose their own wardrobe, but de Wolfe earned the privilege with her growing design skills. The Encyclopedia Britannica states that Stanford White, an architect, was the man who helped de Wolfe land her first design commission. The job? New York’s first social club for women, located on Madison and 31st Street. After its opening, her design work was the talk of the town—bringing in a cascade of new clients for the aspiring designer. She published her book, The House in Good Taste, a few years later. This book began setting some standards on interior design. De Wolfe’s light, airy style created a whole new trend. Her designs were in stark contrast to the dark, stuffy Victorian interiors popular in the day. 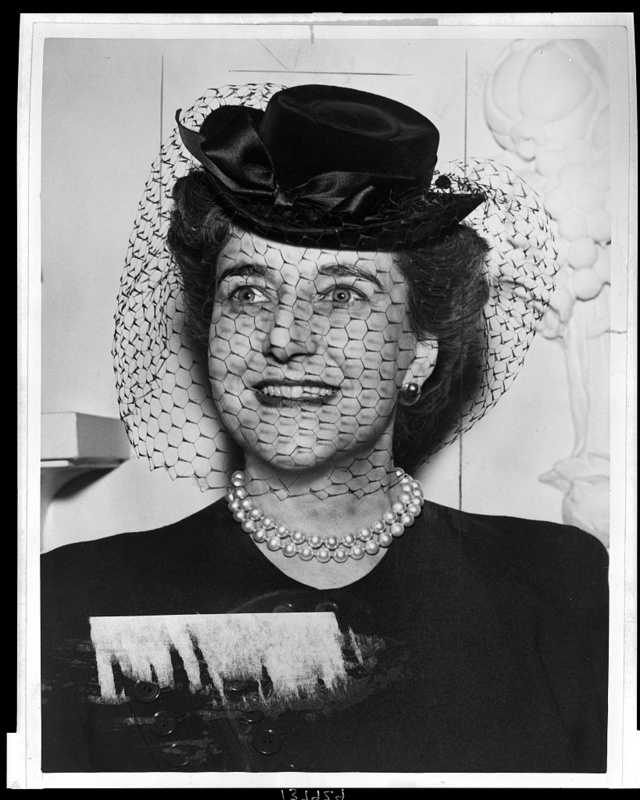 Another designer popular for swimming against the current with her style soon entered the scene—Dorothy Draper. Her website, simply called Dorothy Draper, reveals that she was the first to begin professionalizing the industry. In 1923, she started the Dorothy Draper and Company design firm. The work she did was groundbreaking, not only because the industry wasn’t organized at the time, but because it was so difficult for women to enter the business world. Her design firm stood the test of time—it is still around today, and accepting clients. With their sophisticated tastes and lifestyles, de Wolfe and Draper formed the glamorous aura still surrounding the field of interior design today. What began as a couple of independent decorators has evolved into a complex industry with an endless variety of specialties. It was not without plenty of hard work that de Wolfe, Draper and many others brought the field to what it is today. James Décor gets to put its mark on the timeline of interior design history as the first to introduce Springfield, Missouri to the business in 1946. Interior design is an industry that has stood the test of time thus far, and there is no doubt that it will continue to go down in history. As we all know, good design is timeless. Photo: A showroom at the spring 2018 High Point Market, by Michaela Satterfield. The fall/winter market season is officially upon us! This weekend, James Décor is headed to the semiannual High Point Market in North Carolina. Known as the largest furnishings trade show in the world, the market will be held October 13-17 this year. There are around 75,000 attendees each spring and fall. Over 100 companies are represented in the whopping 11.5 million square feet of showroom area. The event is open to the industry only. Another event you’ll definitely want to check out is Design Miami in Florida. Preview day, December 4, is for invitees only, but the market is open to the public from December 5-9, 2018. Called the “global forum for design,” Design Miami features plenty of exhibitions, as well as seminars on design, art, fashion and architecture. Located in Atlanta, Georgia, AmericasMart is home to many year-round exhibitors. You’ll find even more showrooms open at the markets. The Atlanta International Gift & Home Furnishings Market will take place January 8-15, 2019. It consists of 7 million square feet of showrooms. You’ll also find plenty of networking events and seminars. Photo: Rug showroom, by Michaela Satterfield. The Dallas Total Home and Gift Market in Texas comes next. Open from January 16-22, 2019, you’ll find a plethora of home décor and lighting, as well as accessories and gifts. Dallas is home to an interior design center year-round, which takes up over 200,000 square feet. The seasonal market here features even more showrooms to connect retailers and manufacturers. To wrap up this market season, you’ll definitely want to visit the Las Vegas Market January 27-31, 2019. This market is the primary home furnishings market in the West, and boasts of its relaxed “West Coast vibe.” There are over 4,000 exhibitors featured. The large bedding exhibit is especially notable. The Las Vegas Market is also known for being “focused on the customer experience.” The hospitality at this market is second to none. There’s nothing like strolling through endless showrooms of the newest furniture trends to get your design creativity flowing. 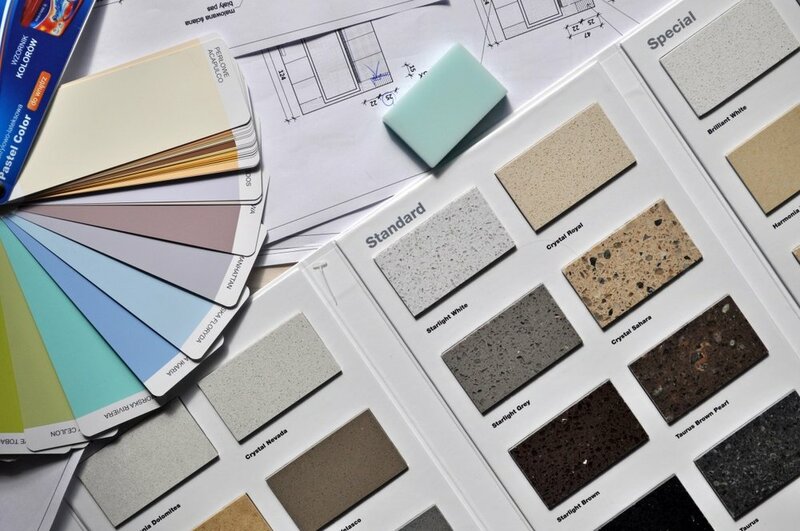 It’s the best way to dive right into the world of interior design. These markets are events you won’t want to miss. Imagine your home, your workplace, your school. The store, the doctor’s office, the bank—places you frequent each and every day. Can you recall the color of the walls? The fabric of the chairs? The location of the windows? The environments we live our lives in frequently go unnoticed. Yet they are always humming in the background, affecting everything from the way we feel to the way we interact with others. They are the backdrops of our lives. Interior designers are educated to keep many different design aspects in mind as they specify and space plan. Whether we realize it or not, the design of the spaces we inhabit has a big impact on us—either good or bad. How? Let’s take a look. Color psychology is a concept frequently utilized by advertisers. Think about any given fast food restaurant’s logo. What color is it? I don’t know which restaurant you thought of, yet I’m willing to bet its logo features the color red. Why? Red is a color frequently associated with causing hunger. It also catches attention and invokes excitement—all things a fast food restaurant is looking to achieve with its logo. According to Will Erstad, author of “The Graphic Designer’s Guide to the Psychology of Color,” every color appeals to certain emotions. Yellow is known to produce happy and excited feelings, while blue is frequently associated with sad and calm feelings. Green is known to make people feel calm and connected to others. Purple is mysterious and linked to wealth or royalty. The colors in our environment clearly make a difference in the way we feel. Aside from the color of the walls or furniture in an environment, the lighting in the room also has an impact on the people in it. Think about how you feel on a sunny day versus how you feel on a cloudy day. I don’t know about you, but I feel more positive and energetic on a sunny day, while I feel more calm and subdued on a cloudy day. In her article on the Huffington Post, author Amanda L. Chan explains that intensity of light correlates with intensity of emotion. So, if a person is in a brighter room, they tend to feel their emotions more strongly. Research backs up the claim. In a study, participants tended to desire spicier food the brighter the light was. They also found other people to be more attractive in brighter light. In dimmer light, participants did not experience these emotions as strongly. Whether it be from the windows or the light fixtures, the presence of light in a room has the power to change our moods. While the effects of color and light in an environment may be obvious, did you know that even the textures in a space can affect your mood? Imagine a soft, fluffy sofa complete with a fuzzy blanket at your home. Now, imagine cold, slick tile floors and a stiff bed with a scratchy blanket at a hospital. I only used textures to describe the scenes, yet one is clearly more appealing than the other. In an article featured on Psychology Today, author Ingrid Fetell discusses the subject. Research shows that people who are experiencing negative emotions crave soft textures. People experiencing positive emotions, on the other hand, don’t pay attention to texture. They are more likely to notice things like color. For example, participants in a study would choose a hand lotion based on the smoothness of it if they were sad. If they were happy, they would select one based on other factors, like how it looked. On top of this, soft or smooth textures can lead to feelings of comfort and relaxation, while hard or rough textures can lead to feelings of formality and stiffness. Not only does the color, light and texture of a room have an impact on its occupants. There is psychology behind how it is all arranged, as well. A great example is a traditional office space. You may picture rows and rows of boring cubicles. Now, picture a big, open room filled with desks that have plenty of room to breathe. There are conference tables in the open area to promote collaboration, as well as smooth flowing traffic patterns. Which office do you want to work in? Research suggests that the size of a room can impact creative thinking, according to Jon Bradshaw, author of “The Psychology of Space Part 1.” The higher the ceiling and more open the room, the more likely people are to think freely and creatively. It is possible, however, for a room to be too big. A room designed for 500 people will make a group of only 100 people feel insecure and discouraged to interact. People also find rooms that are curvilinear to be more appealing than purely rectangular ones. Our environments—composed of color, light and texture, all arranged in specific ways—clearly make an impact on how we live and what we experience. While they go unnoticed, their significance is undeniable. Without the backdrop, after all, there would be no show. Bradshaw, Jon. “The Psychology of Space, Part 1.” Facility Manager, 2015, magazine.iavm.org/article/the-psychology-of-space-part-1/. Chan, Amanda L. “How The Light In A Room Could Affect Your Emotions.” HuffPost, HuffPost, 24 Feb. 2014, www.huffpost.com/entry/light-emotions_n_4831224. Erstad, Will. “Will Erstad.” Rasmussen College - Regionally Accredited College Online and on Campus, 2018, www.rasmussen.edu/degrees/design/blog/psychology-of-color/. Fetell, Ingrid. “Sad Times Call for Soft Textures.” Psychology Today, Sussex Publishers, 2011, www.psychologytoday.com/us/blog/design-and-the-mind/201106/sad-times-call-soft-textures. Well, it’s official. The dog days of summer have finally melted into cool, crisp fall. I don’t know about you, but I am more than ready for all of the bonfires, corn mazes, and pumpkin patches. I’m also ready to cozy up inside with a hot drink and watch the leaves in the backyard burst into a palette of bright hues. The air is chilly and the leaves are changing. You’ve got a comfy chair and a good book. What more could you need to enjoy this new season? 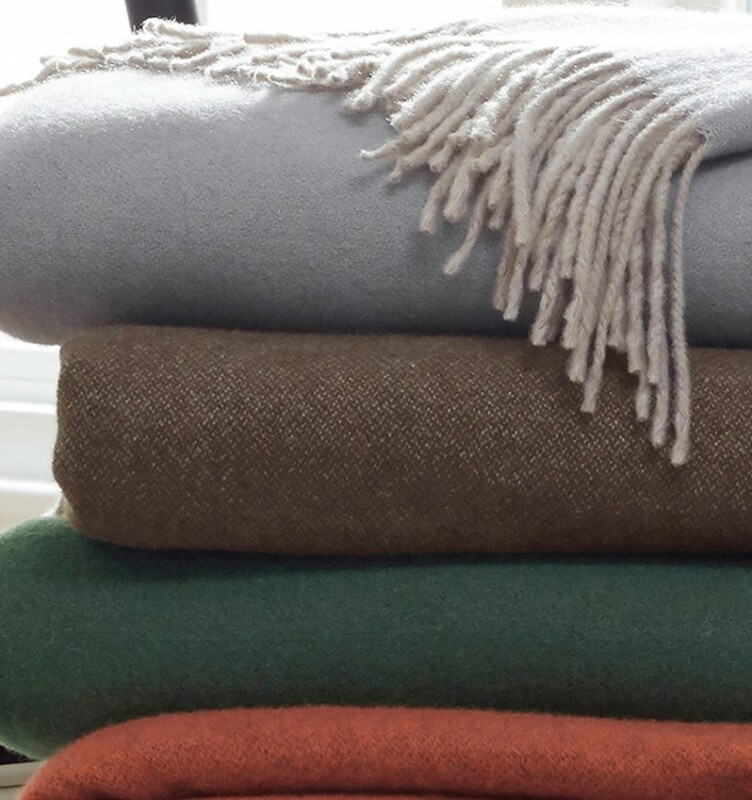 At James Décor, we have a variety of throws in stock. They are available in many different colors and materials, so you’re sure to find the perfect one to compliment your décor. Not only this, but we can custom-order throws from our vendors. The possibilities are limitless. Could the Renna throw from our line Sferra be the perfect one for you? Perhaps this extra warm, furry throw from our line Paul Robert is more your style. What better way to add a cozy touch to your home to get ready for fall than a luxuriously soft throw? Whichever one you go with, light a candle, make a cup of tea and get ready for the coziest season of the year with our throw blankets. Our furry friends hold a special place in our hearts, so it only makes sense that they deserve a special place in our homes as well. Fashionably incorporating our pets everyday necessities into the design of our homes is becoming more common, our pets are part of the family after all! For example, their food and water bowls can take up significant floor space, but a major fad right now is to build dog bowls into the kitchen counter or island. Dog kennels are another large bulky item that is typically an eyesore in the home but you can incorporate a built-in kennel somewhere more convenient. 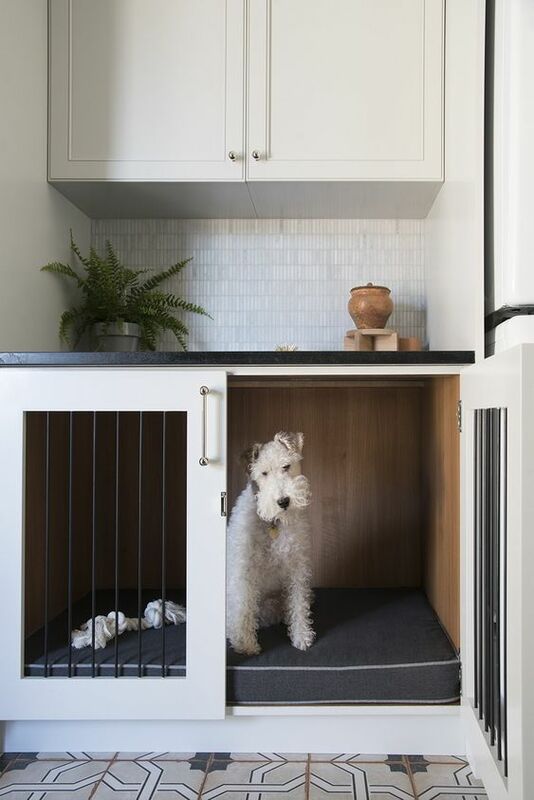 If your dog does not have a kennel and maybe just a bed, they could also be disguised by cabinets, side tables, etc. A walk-in wash station for your dog is something that could be included in your mud room or near your entrance for easy cleanup after they have been outside. It can be a hassle to drag your pet through the house and to the bathroom while their covered in mud from playing outside. Our pets play a major role in our everyday lives and it is only fit that we provide them with the appropriate comforts that we expect for ourselves. 1. Better Homes and Gardens "Little Kitchen with Luxe Faux Features"
2. Room for Tuesday "The Laundry Room: One Room Challenge - Room Reveal"
3. This Old House "Laundry Room Design: Neat and Tidy"
Yes, wallpaper has officially made a comeback and we couldn't be more excited! With updated colors and patterns, this is not the wallpaper you are used to seeing. From powder baths to focal walls and even ceilings, the applications for wallpaper are endless. Don't be afraid to go bold with large scale geometrics or florals, it is a simple way to really add some drama to a space. Wallpaper can give you a color palette to work from or be that perfect final touch to really bring a room together. One of my favorite uses for wallpaper is in the back of bookcases or china hutches. This is a great way to give new life to a piece you may have had for a while. There is a vast array of types of wallpaper, from prints, to grasscloths, cork and even vinyl for commercial use. Whatever your style, there is bound to be a wallpaper out there for you. James Decor carries numerous wallpaper brands including Schumacher, Thibaut, York, Seabrook, Phillip Jeffries, and Koroseal just to name a few. Come by the store and check 'em out! 1. Schumacher, Birds and Butterflies. Designer: Upside Development in Toronto Canada. 2. Schumacher, Queen of Spain. Designer: Kendall Simmons Interiors in Nashville, Tennessee. 3. Schumacher, Summer Palace Fret. Designer: Charmean Neithart Interiors in South Pasadena, California. 4. York, Wilderness. York Photo Gallery. This is our first post! !